ISLAMABAD: Indian hackers seemed to have hacked a Pakistani website and pasted the photo of the Kulbhushan Yadav . The website of Pakistan Academy for Rural Development’s website has been hacked. 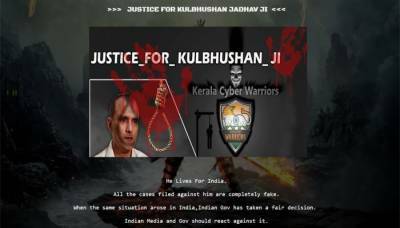 The hackers seemed to be from India, as opening the home page shows a message by ‘Kerala Cyber Warriors’. The website’s main page is warped in a way that it displays a message demanding ‘justice for Kulbhushan Jadhav Ji’. The message reads that the Indian spy, in custody of Pakistani authorities, ‘lives for India’ and all the cases filed against him are completely fake. On April 10, Pakistan has sentenced an Indian RAW agent Kulbhushan Jadhav to death for carrying out espionage and sabotage activities in Balochistan and Karachi, the ISPR had said. According to an ISPR press release, Kulbhusan Sundir Jadhav alias Hussein Mubarak Patel was arrested on March 3, 2016, through a Counter-Intelligence Operation from Mashkel area of Balochistan for his involvement in espionage and sabotage actives in Pakistan. Jadhav an on-duty officer for the Indian Navy confessed to his crimes in a recorded video statement televised by the ISPR last year following his arrest. This isn’t the first time hackers from across the border tried to hack Pakistani websites, in January this year, a Khyber Pakhtunkhwa government website was hacked by ‘Indian hackers’.